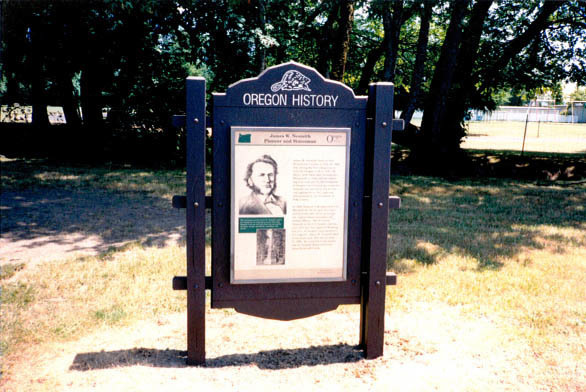 Subject:James Nesmith, a leader in early Oregon government, lived near this site. James W. Nesmith, born in New Brunswick, Canada on July 23, 1820, was among the first emigrants to trek the Oregon Trail in 1843. 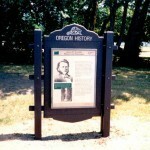 He filed a land claim near present day Monmouth in 1844, and the following year took part in the formation of Oregon’s Provisional Government. Nesmith was elected to the Territorial Legislature in 1847, and was instrumental in the formation of Polk County. In 1853, Nesmith was appointed U.S. Marshall for the Oregon Territory and between 1857-59 he served as the Region’s Superintendent of Indian Affairs. 1861-67 found Nesmith in the U.S. Senate, and the year 1873 saw him again in Washington, D.C. as Oregon’s Representative to Congress. James W. Nesmith died at his home near this site on June 17, 1885. He is buried in the family plot in Nesmith Historical Park along Rickreall Creek.